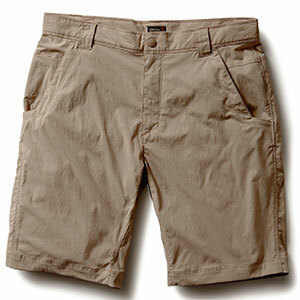 "Patagonia Men's Apparel Clothing Tribune 11 Inch Shorts - Men's-Ash Tan-11 in-28 Waist. 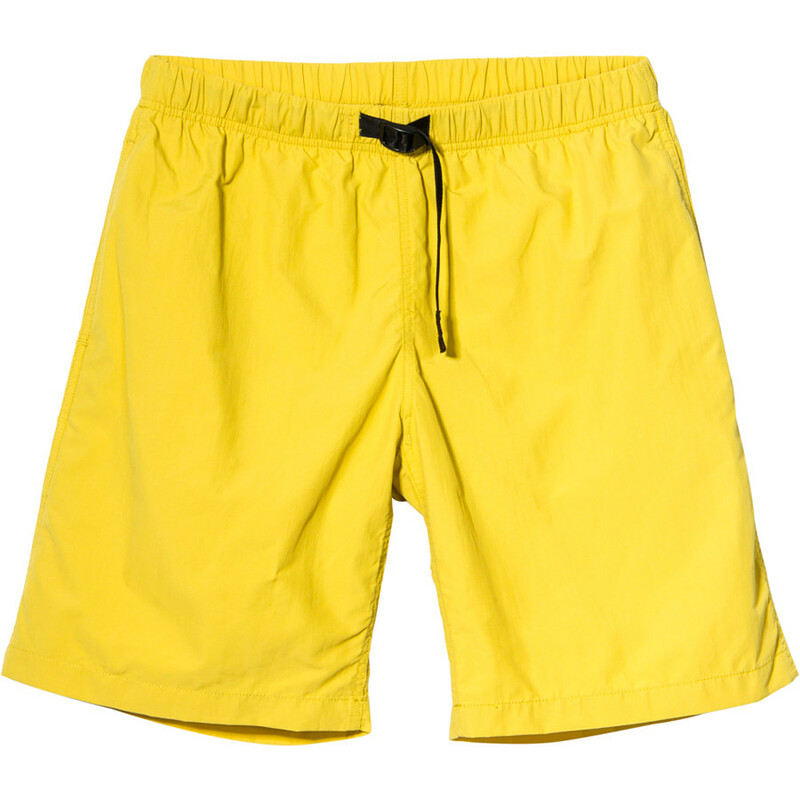 Tribune's feel light on the skinperfect for warmer conditionsand feature a gusseted crotch for natural motion a DWR (durable water repellent) finish to shed moisture and a curved waistband for a personalized fit that stays put. Pockets include two front one rear (with zip closure) and a handy right thigh pocket for your small essentials. Inseam 11 inch." This is what we grab when we start down the road less traveled. 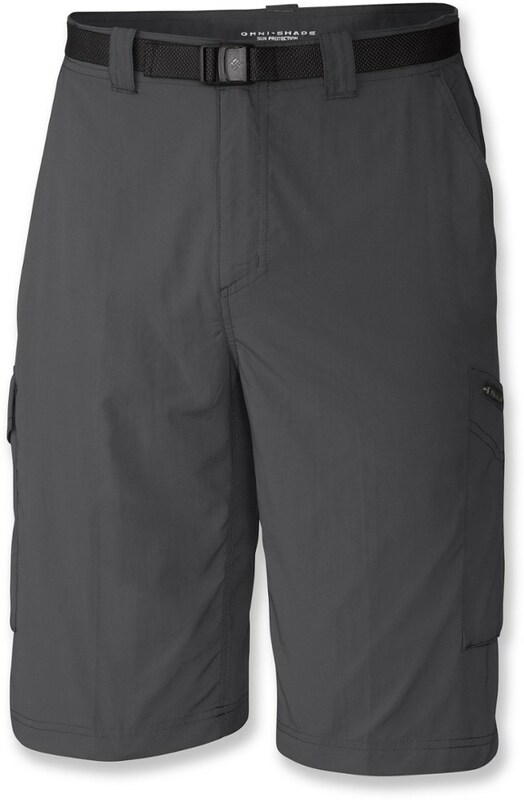 Built for off-trail backpacking remote treks in faraway locations and obscure climbing destinations the Tribune Shorts have a 4-way stretch nylon/spandex fabric that provides the full range of outdoor mobility as well as day-after-day comfort. Tribune's feel light on the skin perfect for warmer conditions and feature a gusseted crotch for natural motion a DWR (durable water repellent) finish to shed moisture and a curved waistband for a personalized fit that stays put. Pockets include two front one rear (with zip closure) and a handy right thigh pocket for your small essentials. Inseam 11". Comfortable multi-functional shorts made of a lightweight 4-way stretch nylon/spandex fabric with DWR (durable water repellent) finish Built from 4-way-stretch fabric these shorts feature a slimmer version of our classic performance fit and provide mobility and comfort Curved waistband design follows the natural shape of the hips and provides a contoured fit to help keep shorts in place during movement; metal button closure with zip fly Two slanted zippered handwarmer pockets; one zippered drop-in cargo pocket on the right leg; one right-rear zipper pocket 11" inseam 5.1-oz 88 nylon/12 spandex with 4-way stretch and a DWR (durable water repellent) finish. Fabric is bluesign approved 280 g (9.9 oz) Made in Vietnam. The stretchy fabric of the Patagonia Tribute shorts ensures you'll be ready to pedal into a headwind to reach work, run to catch a train, or hustle to stay ahead of an afternoon shower. If you've ever run to catch a train, pedaled into a headwind to reach work or hustled to stay ahead of an afternoon thundershower, then you know the significance of stretch. Built for off-trail backpacking, remote treks in faraway locations and obscure climbing destinations, Tribune Shorts have a 4-way stretch nylon/spandex fabric that provides the full range of mobility as well as day-after-day comfort. Tribunes feel light on the skin-perfect for warmer conditions-and feature a gusseted crotch for natural motion, a DWR (durable water repellent) finish to shed moisture and a curved waistband for a personalized fit that stays put. Pockets include two front, one rear (with zip closure) and a handy right thigh pocket for your small essentials. Inseam 11". 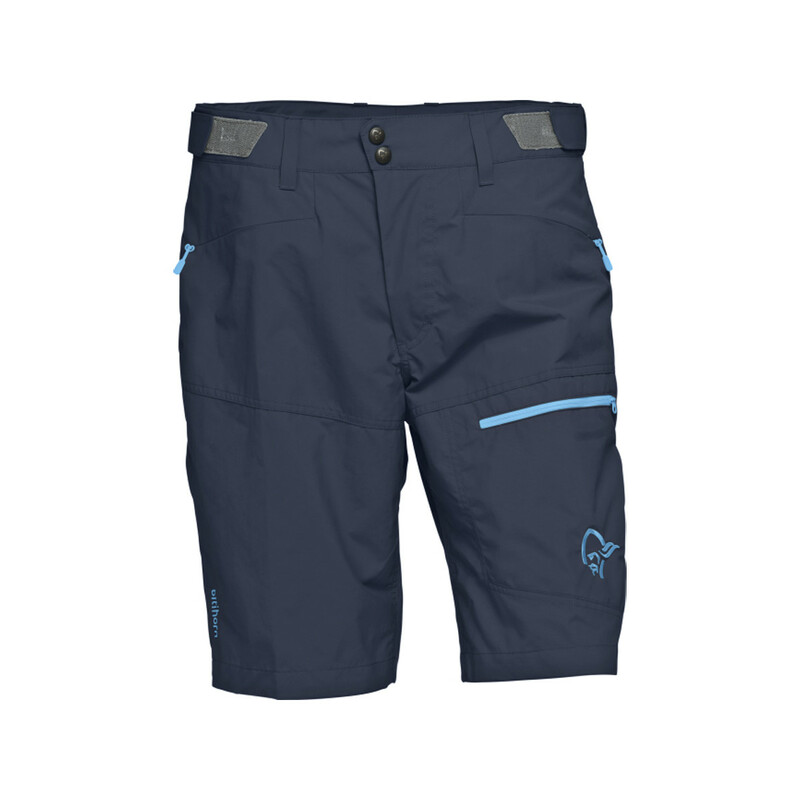 Built for off-trail backpacking and obscure climbing destinations, the Patagonia Men's Tribune Shorts (11 inch) provide a full range of outdoor mobility. This is what we grab when we start down the road less traveled. Built for off-trail backpacking, remote treks in faraway locations and obscure climbing destinations, the Tribune Shorts have a 4-way stretch nylon/spandex fabric that provides the full range of outdoor mobility as well as day-after-day comfort. Tribune's feel light on the skin-perfect for warmer conditions-and feature a gusseted crotch for natural motion, a DWR (durable water repellent) finish to shed moisture and a curved waistband for a personalized fit that stays put. Pockets include two front, one rear (with zip closure) and a handy right thigh pocket for your small essentials. Inseam 11 in. 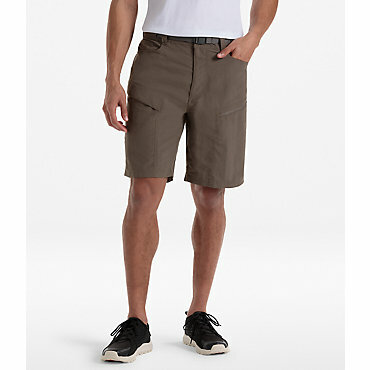 Comfortable, multi-functional shorts made of a lightweight 4-way stretch nylon/spandex fabric with DWR (durable water repellent) finish . Built from 4-way-stretch fabric, these shorts feature a slimmer version of our classic performance fit and provide mobility and comfort . 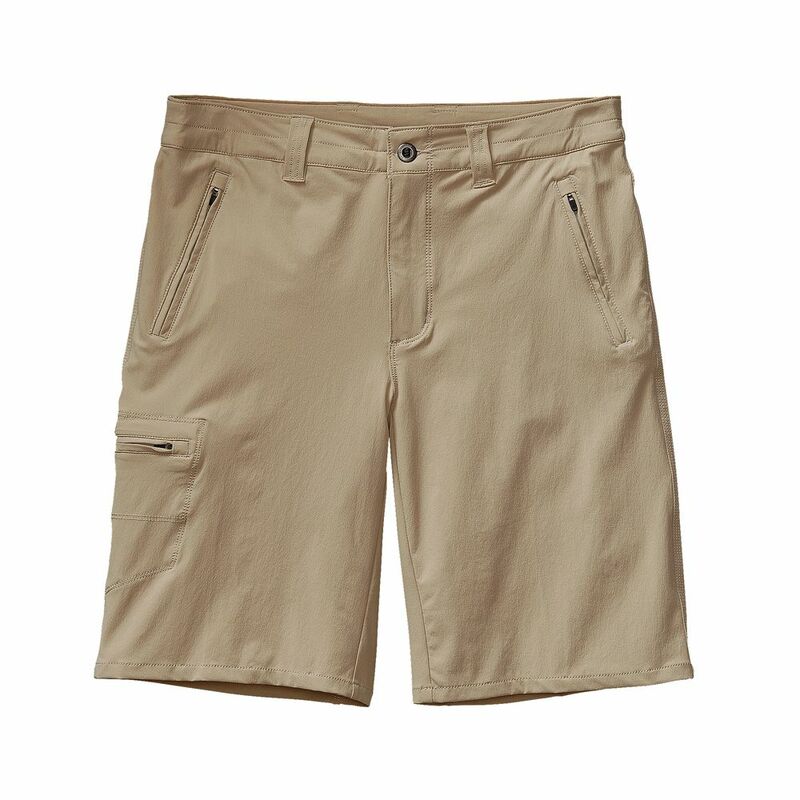 Curved waistband design follows the natural shape of the hips and provides a contoured fit to help keep shorts in place during movement; metal button closure with zip fly . Two slanted, zippered handwarmer pockets; one zippered, drop-in cargo pocket on the right leg; one right-rear zipper pocket . 11 in. inseam . 5.1-oz 88% nylon/12% spandex, with 4-way stretch and a DWR (durable water repellent) finish. Fabric is Bluesign approved . 280 g (9.9 oz).